Where the film slips up is in its writing. The plot, which starts off on a curious note becomes especially convoluted in its second hour. The laughs are now few and far between, and the screenplay takes forever to come to the point. I’m going with two out of five for Behen Hogi Teri . You’d wish the makers had trimmed its flabby bits; there was potential here. Behen Hogi Teri Could and should have been a better film. Half Star is extra for Rajkummar Rao. On the whole, Behen Hogi Teri is an enjoyable entertainer but the screenplay defects will keep it from realising its full potential at the box-office. Acceptance of Rajkumar Rao as a solo romantic hero in a commercial film also doesn’t seem probable. The chaalu title will keep the family audience away. Although its collections may pick up during the weekend due to the comedy, its terribly poor start will completely spoil the show. 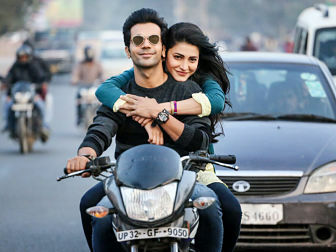 The only real spark in the terribly tepid Behen Hogi Teri is provided by Rajkummar Rao. Solid as Shiv ‘Gattu’ Nautiyal, the boy who is more a callow, pesky teenager than the man he should be, the lead actor receives little support from either the patchy screenplay or the remainder of the cast. As a consequence, the film wallows in a morass of mediocrity and all its efforts to heave itself out of it falls flat. And the entire mohalla in Lucknow is dogged about making Gattu, Binny’s rakhi brother. With such a heart-tugging storyline — that this country’s youth could easily connect with — director Ajay K Pannalal is often found groping in the dark to set the film’s pace match your heartbeat. The Shruti-Raj chemistry is worth dying for, but the director and story writer Vinit Vyas’s ideas of a romantic-comedy quite don’t match your expectations. The movie takes place in a world where grown men still operate by the rules of teenaged boys: they play gully cricket, hide from girls on Raksha Bandhan, put silly curses on each other and ask their parents for money. The plot is juvenile to say the least. It is a little disheartening to see a movie that incorporates casual sexism and regressive norms without any plan to combat them. But the only reason to smile at the movie is Rajkummar Rao. The movie is packed with performers of various calibers, but Rao – the only reason to even attempt this – is better than everyone and their brother. The plot of the film and the concept appear a bit different from the conventional romantic outings that we have seen so far. While the first half is enjoyable with the well timed comic gags that elicit a response from the audience, the second half is a huge downer and that is where the film falters. On the whole, though BEHEN HOGI TERI has an interesting premise, the film disappoints due to a weak script. At the box office, the film will have to depend on good word of mouth to post decent numbers. But the filmmakers are having too much fun to notice that the running time (128 minutes) is far too long, the climax isn’t strong enough to support the preceding events, and Binny is regressing. The woman at the centre of the swirl isn’t developed enough to ever come into her own. Gattu is more of an anti-hero than a traditional leading man with all the answers, which must count as progress. But Binny resolutely remains the Hindi film heroine usually found in such films – the trigger for all the events, and the cause of all the sorrows. It’s easy to forsake this film as regressive and the society portrayed here as dated and disconnected from reality. But then, when have screwball comedies in Hindi cinema subscribed to being politically accurate or sensitive? If they were, No Entry would be shunned for objectifying women and Thank You would be banned for making light of domestic abuse. So, leave your brains and other organs at home and take your SO for this date film before you’re pronounced man and behen. The best thing about the film is its novel idea. Unfortunately, it hasn’t been executed well. Haasan, as a feisty Punjabi girl, is a misfit. You can see her effort, but she appears stymied on most of scenes. ‘Behen Hogi Teri’ has some funny moments and attempts to upgrade the rom-com genre in Bollywood, but it doesn’t offer anything new. Take a chance with this one only if you enjoy the genre. Gattu is a 23 year old middle class boy from Lucknow who is in love with his neighborhood crush Binny (20) since his childhood days. However, his family members believe that all girls of the mohalla are like one’s sister and hence, Binny too has been accorded Gattu’s sister since the day they were kids. Gattu, though, doesn’t believe in this ‘behen-bhai ka pyaar’ definition. He knows this is his age is to do ‘girlfriend wala pyar’ and he will convince both firebrand Binny, who is famous in tying rakhi to every boy of the mohalla, and their family members that Binny will none other than his life-long love.